The following covers the objectives which we need to learn for the topic of ‘OB’. The notes below are guidelines to what we should know; they do not go into detail, to find more detail please use the search at the top and find the corresponding theory on the website. 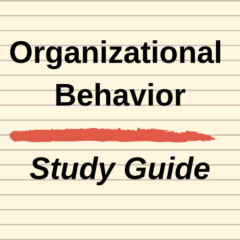 Objective: To define the terms: Organisation and Organisational Behaviour. Objective: To identify factors influencing Organisational Behaviour and Organisational Effectiveness. The way the organisation is treated, such as, like machines. This could adversely effect motivation. PESTLE: These factors can effect organisations in many ways. Objective: To introduce different research perspectives and different research methods. Ask the right questions, specific to make sure the answer is the one you want.